Clouds reveal the ever-changing shapes of air currents constantly flowing around us, which are usually beneath our awareness. Photography became my primary vehicle for exploring the temporary spatial structures in the sky. Searching for an even better way to communicate this deeper understanding to others, in 2009 I started hand-coloring parts of my prints with pastel pencils. 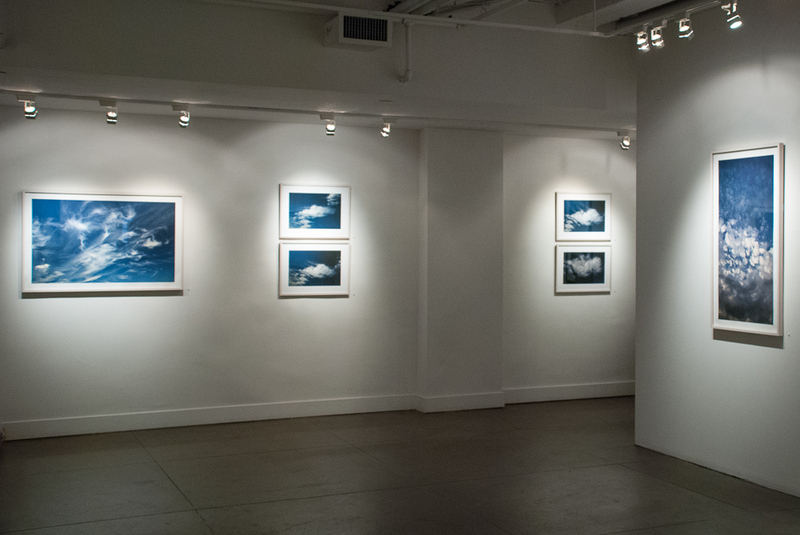 These prints have been exhibited in solo exhibitions at the Nailya Alexander Gallery (photo at left), New York and Hillyer Art Space, Washington, D.C., and in group exhibitions at the Delaware Museum of Art, the New York Hall of Science, and other venues. See selected photographs, a sculpture, and other exhibition photos and project description below. Overview: Several years ago, I began to wonder why forms and patterns in nature look the way they do. Readings on the subject led me to chaos theory and complexity theory, which view the world as dynamical systems cycling in a constant flow between stability and instability, order and disorder, information and noise. I started to understand natural formations differently, recognizing rhythms and patterns — albeit complex ones — in what at first appears random and chaotic. Clouds reveal the ever-changing shapes of air currents constantly flowing around us, which are usually beneath our awareness. Photography became my primary vehicle for exploring the temporary spatial structures that I was now discerning with the insights of science. Searching for an even better way to communicate this deeper understanding to others, in 2009 I started hand-coloring parts of my prints with pastel pencils. I may alter the tonal range and some of the color information to bring out the spatial qualities of the subject, but I never distort or augment forms. What you see in these images was all there. As I hand-color the photographs I search for a deeper understanding of what's really going on and what those formations tell you about the particular conditions of the moment. These are temporary presences captured at a particular point in time, emotionally resonant moments selected from an ongoing stream of possibilities, never to be precisely repeated. In 2007, I collaborated with a 3D imaging technology firm to produce a sculpture from one of my cloud photographs. That sculpture is shown under the "Other Prints & Sculpture" tab in the slideshow above. Some of the works shown here are sold, however, I accept commissions for larger or smaller hand-colored prints.